In its generous 50mm, rose gold and DLC steel case, already appreciated in the Perrelet collection, the new interpretation of this rare automatic Tourbillon with off-centre hour and minute display, is a magnificent demonstration of style. 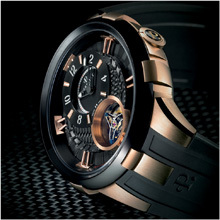 Perrelet has chosen to work the structure and composition of its latest creation in depth, in order to evoke the multidimensional aspect of time. 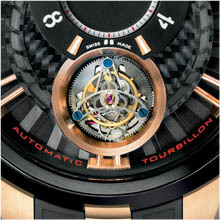 Thus the cage of the flying tourbillon is presented inside a cylindrical ring positioned at 6 o’clock. The small second’s indication is provided by the revolving of the cage, which completes one full rotation every 60 seconds. Two wing-shaped, carbon fibre zones lead the eye towards 12 o’clock, where the tips of the hour and minute hands are finished in a luminescent material. The minute hand, precisely profiled to rise out of its recessed base area, matches the contours of its surrounding limits perfectly. The extensions of the claws gripping the case embellish the dial in the form of six double tubes, adding force and character to the whole. This complication is completed with a black rubber strap and DLC steel tongue buckle in a limited series of 20 pieces only. 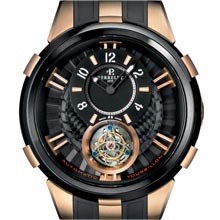 Skilfully combining avant-garde with tradition, this out of the ordinary timepiece would certainly have appealed to the inventor, Abraham-Louis Perrelet; because over and above the product, there is man, the love of the know-how and the pleasure of sharing a passion.